Bicycle vs truck accidents in California are an unfair “fight”. This is especially true in cities with a high mix of cyclists and truck traffic like San Diego, Los Angeles, Orange County or the Inland Empire. A large percentage of the population owns and rides bicycles, according to statistics that the National Highway Traffic Safety Administration released. More than 57 million people rode bikes in 2002, and more than 2.5 billion people ride bikes today. The number is becoming increasingly high because the price of fuel continues to rise every day. Bicyclists are jumping on their bikes to travel to work, get exercise and perform household chores. 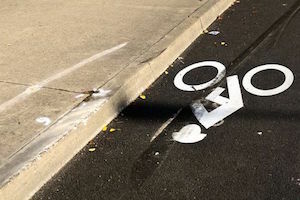 Many towns have started accommodating cyclists by paving separate bike lanes on the roads. Unfortunately, bicyclists still have a high accident rate even with the existence of obvious bicycle lanes. More than 48,000 people were involved in bicycling accidents with vehicles in 2013, and 743 of those people died. The number has risen over the past five years, and some of the incidents involved large tractor trailers. Many states have helmet laws that require their bicyclists to wear a helmet on the road, but a helmet is just not enough to protect a person when the other accident party is in a truck. Bicycle and truck incidents are some of the most devastating incidents a rider can have. They occur for a wide variety of reasons. One reason that a truck may collide with a bicycle is a vision issue. A non-assertive truck driver could fail to see a bicyclist in a blind spot because of the truck’s height. Large tractor drivers have a difficult time seeing a person who is riding a small bike on the ground level directly to the right or left of the truck. Another reason that a truck may collide with a bicyclist is the trucks delayed stopping because of the high momentum. Other factors that can affect a truck driver’s ability to drive are inexperience, alcohol and drug consumption and distraction. It is imperative for truck drivers to pay close attention to the road at all times. Bicyclists must stay alert to the world around them, as well. Some bicyclists bring their music players and headsets along for a trip. Such can cause them to miss a horn honk that could warn them of a fatal danger. Bicycle riders can have the same hindrances that truck drivers can have. They can be inebriated, intoxicated or highly emotional. Bicyclists should be careful to concentrate solely on the road while they are riding. Hundreds of gruesome injuries can occur in a truck vs. bicycle accident. The impact of a truck on a person’s body is so strong that not many people survive. The impact vehicle usually hurls the bicyclist several feet from the incident. In fact, there have been numerous incidents where the bike accident victim’s body has been found tens and even hundreds of feet where the initial impact occurred. One very common scenario is an 18-wheeler turning right without warning and then hitting and dragging a cyclist that is riding or even stopped along the right-hand side of the rig. Most accidents in that category occur because of the truck’s blind spot. Examples of some common injuries that a person can get from a truck and bicycle collision are a broken neck, crushed skull, brain damage, broken legs, broken arms, paralysis, broken spine and more. The injuries that occur from an accident between a bicycle and a commercial vehicle can break and destroy an entire family. A person who survives may have to spend a month in the hospital, which will create astronomical medical bills. The surviving family members will have to pay the funeral expenses for a deceased person. Furthermore, the victims will have to work through emotional pain, missed work and other losses. An injured bicyclist may qualify for personal injury compensation if the truck driver is guilty of neglect. A personal injury lawyer can examine the case and assess its validity. Survivors may be able to receive compensation for a family member who dies from such an incident. Compensatory damages can pay for medical bills, lost work wages, therapy, household bills and the like. Bike riders can also recover pain and suffering (including both compensation for physical pain and emotional distress) if the commercial truck driver is guilty of negligence. Truck drivers and bicyclists can decrease their chances of having an accident if they stay alert and fresh during their trips. For more information on bicycle accident claims in California – visit our webpage.